These retirement plans report data to the PRB in annual financial reports, actuarial valuations and other studies, and investment and membership reports. This data center presents the reported information by plan and comparatively by plan type and asset group. The following graphs summarize some of the key indicators of financial health for Texas public pensions in the aggregate. 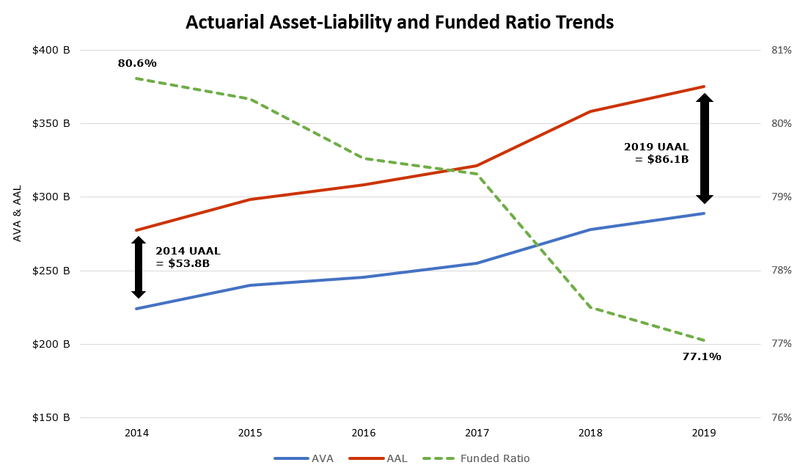 Since 2013, the overall unfunded accrued actuarial liability (UAAL), which is the difference between the actuarial value of assets (AVA) and accrued actuarial liability (AAL), has steadily increased. The aggregate funded ratio, in turn, has decreased over time. A plan’s amortization period is the time it would theoretically take to fully fund any unfunded liability (UAAL) or fully recognize a surplus. The PRB Pension Funding Guidelines establish a maximum amortization period of not more than 30 years with a preferred target range of 10 to 25 years. More than half of the plans have current amortization periods within 30 years. Amortization periods are reported in actuarial valuations, which are conducted by Texas plans at least every 3 years according to law. 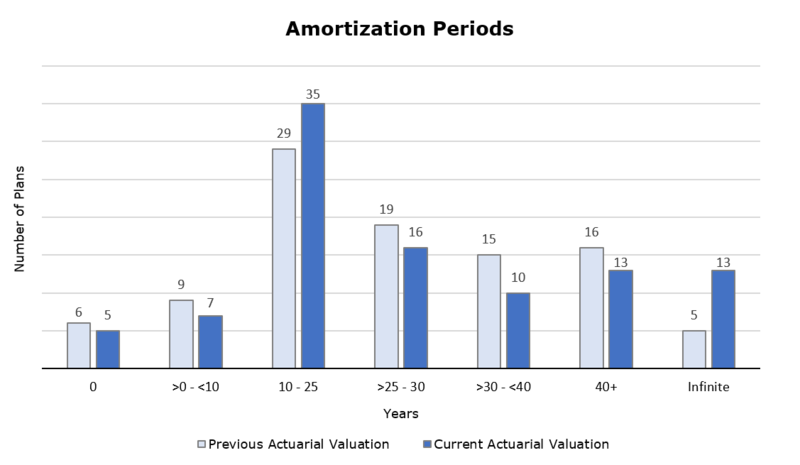 Amortization periods displayed are from the most recent and previous valuations received by the PRB as of December 2018. The investment return assumption is a key actuarial assumption which directly impacts a plan’s liability calculation and contribution requirement. A higher return assumption leads to a lower liability calculation and therefore lower contribution requirement and vice versa. In response to projected market conditions and actual plan experience, retirement systems have reduced return assumptions in recent years. The average investment return assumption for Texas systems is currently 7.37%. The national average is 7.28% (NASRA, February 2019). Return assumptions are reported in actuarial valuations, which are conducted by Texas plans at least every 3 years according to law. Return assumptions displayed are from the most recent and previous valuations received by the PRB as of December 2018. In the past year, Texas plans have generated positive net returns. However, unweighted average returns have been below their assumed rates of return over the past three to ten years. Any market volatility can result in plan investment returns that are greater or less than their long-term averages. Actual returns obtained from the most recent fiscal year-end investment return and assumptions reports. Long-term return is 30 years or longest term available. All figures are net of fees. Assumed returns obtained from most recent actuarial valuation reports. Plans' asset allocations changed between 2007 and 2017, most notably, in the growth of alternative investments from 4% of total assets in 2007 to 32% in 2017. Alternative investments generally include hedge funds, private equity, commodities, foreign currency, venture capital, derivatives, and other instruments. Figures obtained from the most recent fiscal-year end annual financial reports and may differ from allocation targets in investment policy statements. This data center contains information reported by retirement systems to the PRB in annual financial reports, actuarial valuations and other studies, and investment and membership reports. The reported information is presented by individual plan and comparatively by plan type and asset size. The information may not reflect a system’s current status, only its most recently reported information. Deadlines for reporting information vary and may be viewed here. Historical data and trends presented are not intended to predict future events or continuing trends. The information in this data center is intended to meet the Texas Government Code Section 801.209(a) requirement to post each public retirement system’s most recent data from reports required under Chapter 802, as well as to meet the Section 2054.1265 requirement for state agencies to post high-value data sets created or maintained by the agency on a generally accessible internet website maintained by or for the agency. © 2018 Texas Pension Review Board. All Rights Reserved.